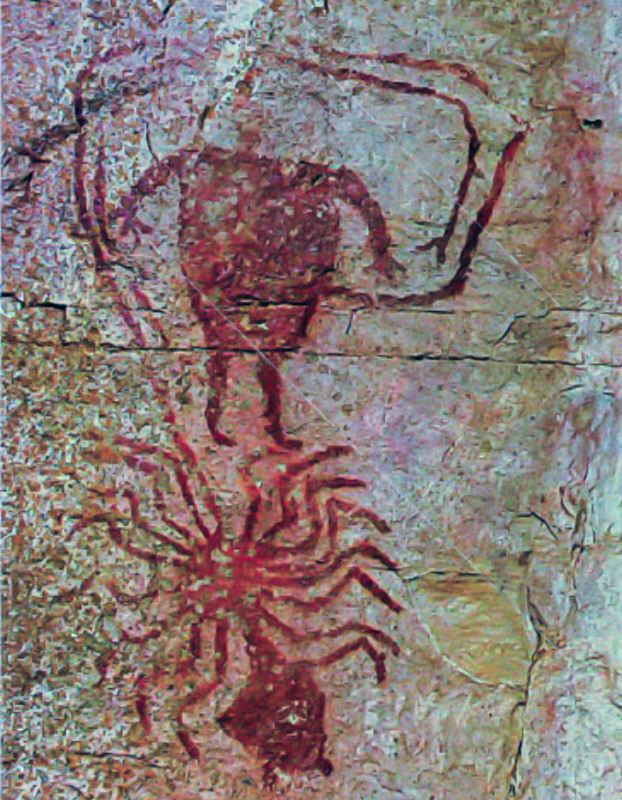 In Anishinaabe Pictograph Sites of The Canadian Shield, I provided an introduction to this series of posts on aboriginal rock painting sites. 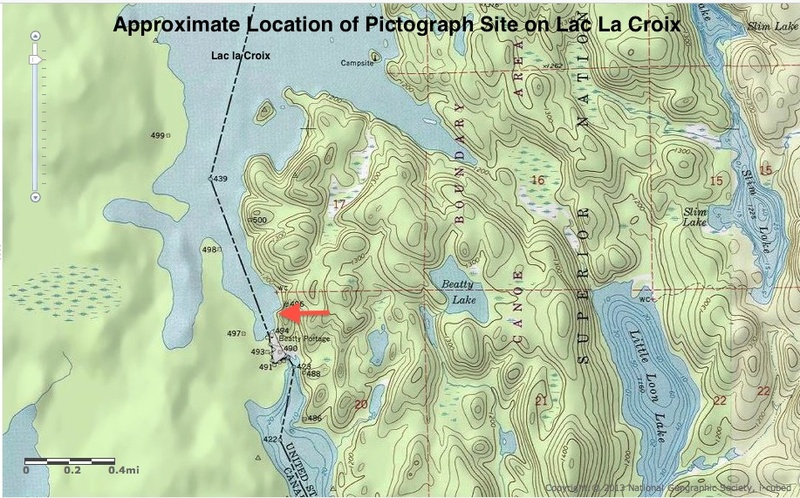 Originally one long and unwieldy post, I have divided it up into individual posts for each of the provinces or U.S. state areas where the pictographs are found. This should make it the search for specific sites that much easier and faster. (N.B. Anishinaabe, Chippewa, and Ojibwe all refer to the same people. To top it off there are a number of spellings of these terms! All blue text leads to a map, additional info and/or pix with a click. 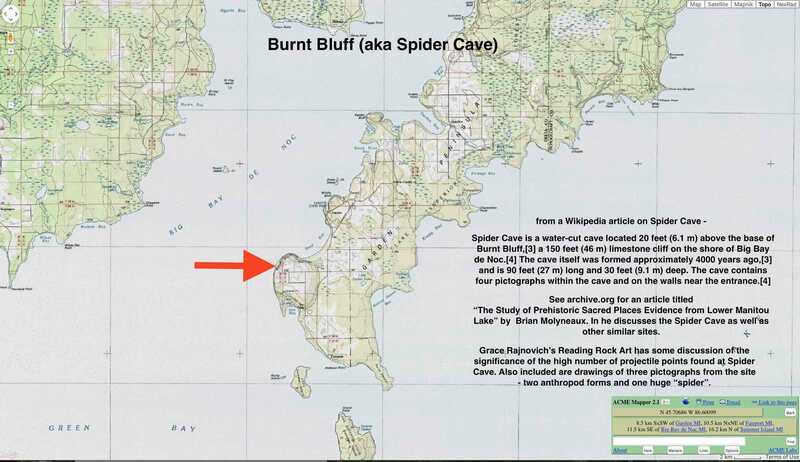 Burnt Bluff – another post here. The pictographs would seem to be pre-Chippewa but how old is open to debate. Wisconsin – I know … not really a border state! 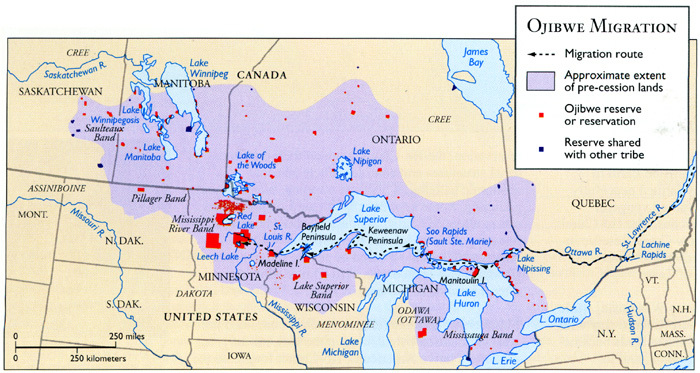 While these sites are actually out of the Canadian Shield area and not the work of the Chippewa people who moved into the lower Lake Superior area after 1600 C.E., it is interesting to see the presence of similar motifs and mythological concerns. While the Thunderbird is a central figure in the worldview of the Anishinaabe, it is also found in west coast cultures like the Nootka, as well as in Lakota Sioux myth. The drawing above is of the thunderbirds depicted multiple times on that Twin Bluff rock face! 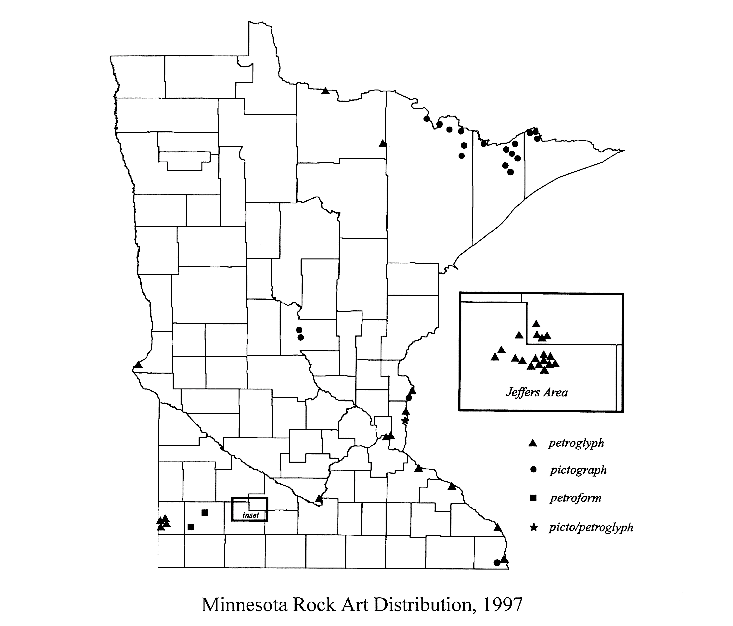 An excellent summary article –“Visions In Stone: The Rock Art of Minnesota” by Mark J. Dudzik in The Minnesota Archeologist (1995 – 54 (Omnibus Issue):98-108) is available here. 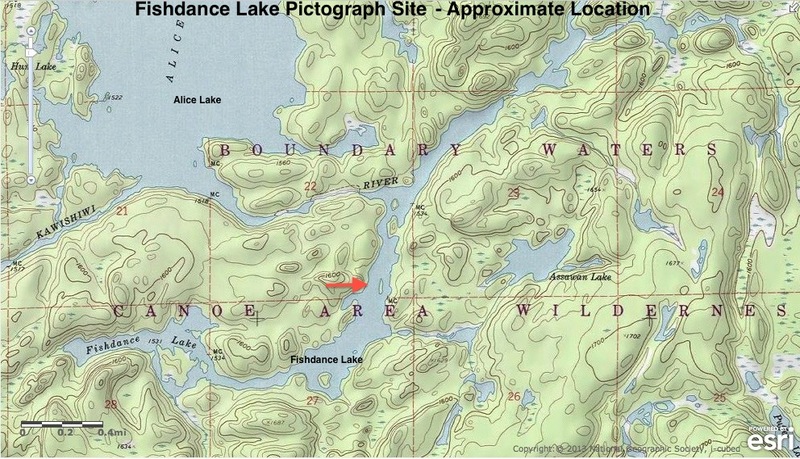 Dudzik lists the fifty-five known sites scattered across the state and Includes the map below showing their general locations. It indicates fifteen pictograph sites and a couple of petroglyph sites in the Shield portion of the state along the border with Canada. My copy of Furtman’s book is due to arrive in mid-December 2013 and I look forward to getting it. 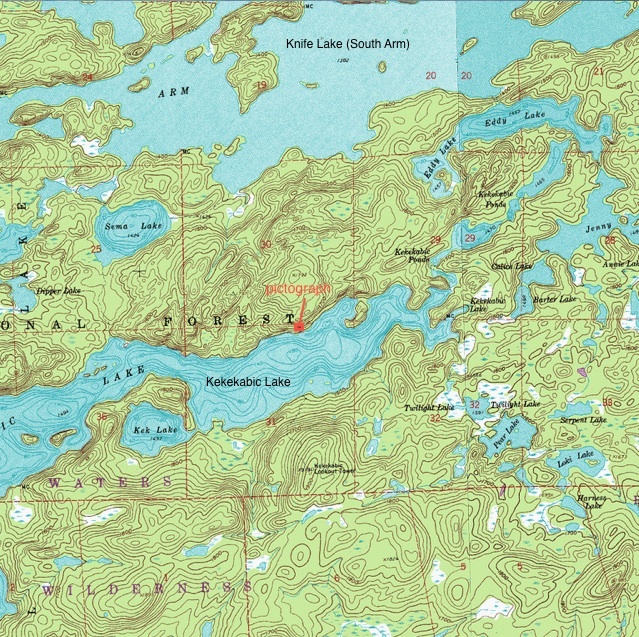 I have never visited the Boundary Waters/Quetico area but my newfound obsession with pictographs definitely gives me one more reason for making the journey from Toronto. Furtman’s book will be somewhere in the dry pack! 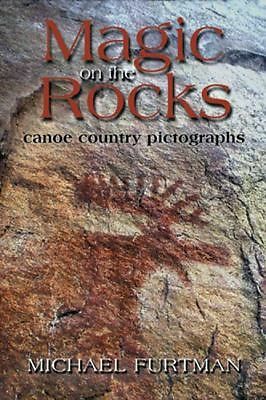 This entry was posted in Pictographs of the Canadian Shield and tagged Beatty Portage paintings, Burnt Bluff painting, Furtman Magic On The Rocks, Gottshall Rockshelter, Gullickson's Glen, North hetman Lake pictographs, Twin Bluff petroglyphs. Bookmark the permalink.